This chapter contributes to the advancement of scholarly knowledge in the context of the longstanding innovative work of Mariane Hedegaard. Specifically, we draw together the major themes that have emerged as members of the cultural–historical research community has engaged with Hedegaard’s wholeness approach to researching child development and promoting learning. The key concepts that make up the approach, and the methods she developed, are brought together in the chapters in relation to how others have used and further theorised her work. The collection of chapters, therefore, also reveals new concepts and ways of researching learning and development. We discuss the content and concepts of a wholeness approach, through the lenses of: studies of child development from a wholistic perspective ; life in schools; and methodological approaches and philosophical considerations. What is unique about this book, is that all contributors have been engaged in conversations with Hedegaard and her work over many decades. The present chapter captures and advances the mutual connections of cultural–historical theory, practice and research methodology that are elaborated in the individual chapters. The editors of this volume are grateful to Elsevier publishers and Prof. Mariane Hedegaard for permission to reproduce Chap. 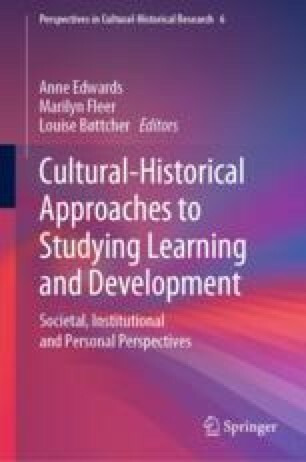 2, which was first published in Learning Culture and Social Interaction: https://doi.org/10.1016/j.lcsi.2018.04.008.